Today I have a special layout to share with you. I created this layout for my niece who recently graduated. I wanted to make it extra special. This layout features some beautiful flowers I created. I call them; RicRac Rosette Ribbon Flowers. I got my hands on some of the velvety ricrac from MAY ARTS Ribbon and started playing. 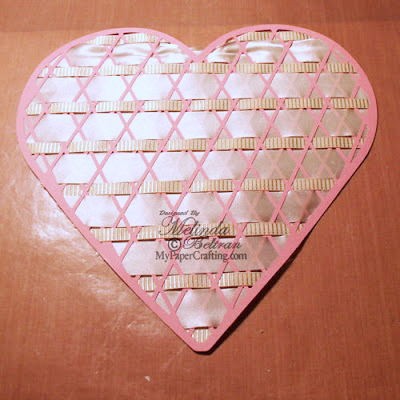 I created and cut my lattice heart with my Pazzles Inspiration. Next I used some May Arts Satin Ribbon and did some basic "basic weaving". I glued and trimmed the ribbon to the edges of the back of the heart. Here's a close up of the butterflies. I inked the edges and added some Liquid Pearls to their centers. Here is an angled look showing the dimension of all the pretty flowers. Here is a closer look at the rosette with a paper lace doily. I added some liquid pearls to different points on the doily for some additional "prettiness". 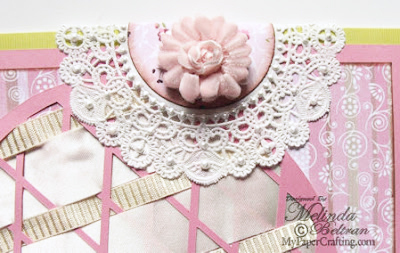 Here's a closer look at the little rosettes on the satin border "swag". 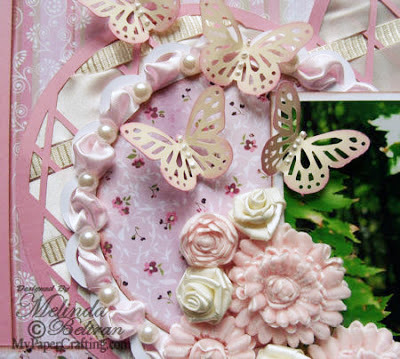 I added some pretty May Arts fuchsia pink polka dot ribbon for a splash of vibrant color. 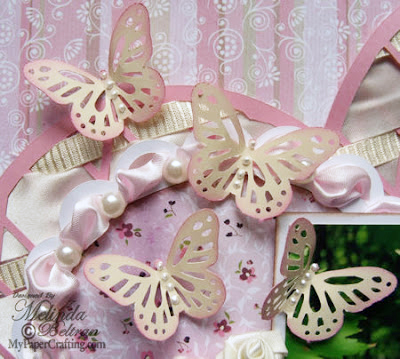 Here's a closer look showing the rich pretty pink satin ribbon I used to weave through the scalloped paper circle frame. 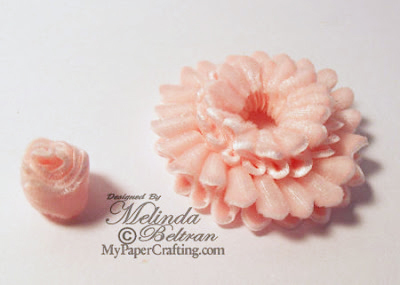 How To Create The Ric-Rac Rosette Ribbon Flower. Photo Step By Step Instructions. Threading a needle, start on one end by going "up" from the bottom. Make sure you start on a "low" point of the ric-rac. Once you pull the thread through, go back down through the very next "low point" on the ric-rac. Continue going up and down on the "low points" of the ric-rac. 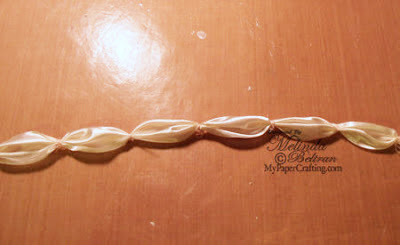 One you pull your ribbon tight, your length of ribbon will now look like this. Close up the ribbon and adhere to a piece of cardstock. This creates one layer of your flower. 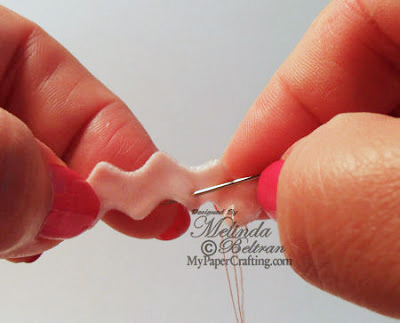 To create the second layer repeat above using a "longer" strand of ric-rac. 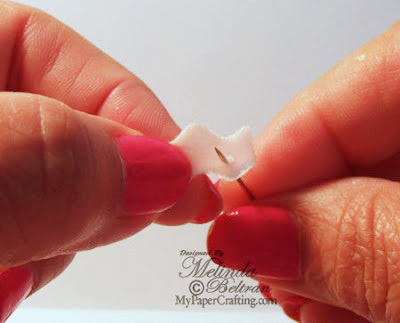 To create the centers, simply apply adhesive to a strip of the ricrac and then roll the ric-rac onto itself. 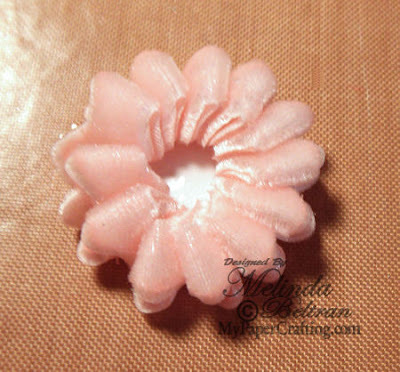 Here is what the rosette looks like before I add the center in. This shows you the height of the finished flower. This shows you the width of the flower. Here is one last look at the layout. Green, Pink and White Cardstock. Thank you so much for sharing your crafty time with me. Just had to come on and tell you what a wonderful job you made of the flowers but also the vidio. Going to give those a try for sure. These are great. I don't sew either, but I want to try them. Where do you find the ric-rac? It's absolutely beautiful! I love the rosettes, so pretty and such a good idea! for starters your layout is beautiful, love the sof look and pastels and definitely love the ricrac rosette, thanks for the video! Wow Melin, I loved your video!!! 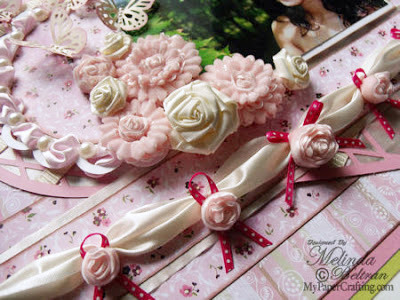 Now I've got to find me some rick rack to make these beautiful ribbon rosettes! How clever and crafty of you to figure this out! Your layout is so elegant and stunning. 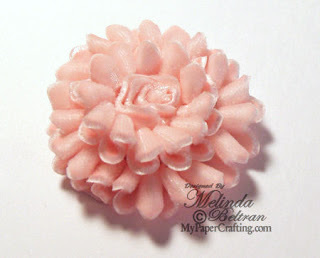 Thanks for teaching us how to make one of these rosettes too!! Hugs! Love it! So soft and girly! Great LO for your beautiful niece. Love Love Love this LO! Thank you so much for your tutorial! 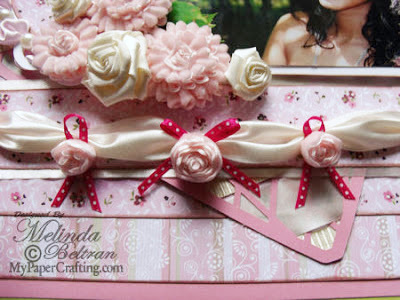 I cant wait to try making my own flowers, love it!!! Great video Melin...the basting stitch looks pretty simple, but the finish product is beautiful...Thanks for sharing. great job with the flowers and video, they are gorgeous! Will have to give them a try.